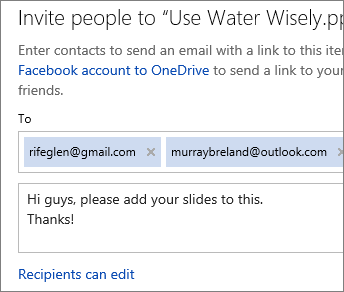 Your Office document is stored on OneDrive. Now share it with your friends, or with the world. 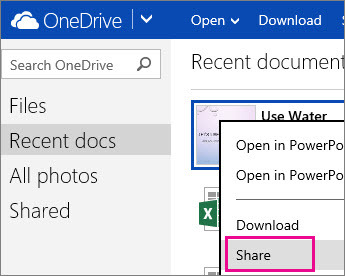 Go to your OneDrive, and right-click the document, and then click Share. Type the email address of the person you want to share with. Press ENTER between multiple addresses. 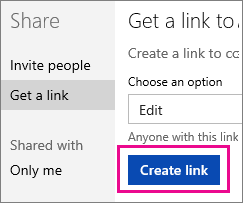 When you click Share your message includes a link to the document. Your recipients will need to sign in with a Microsoft account to edit the document. 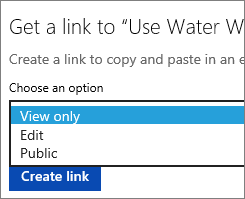 If you don't know the person's email address, or if you want a link that will let people edit your document without having to sign in, click Get a link after you click Share. Then click Create link for a link that you can copy and paste. Tip: If you’re pasting in a tweet, or if the URL just seems too long, click Shorten, and then copy it. If you want people to see your doc without editing it, you can share it as view-only. In the invitation, click Recipients can edit, and then switch to Recipients can only view. 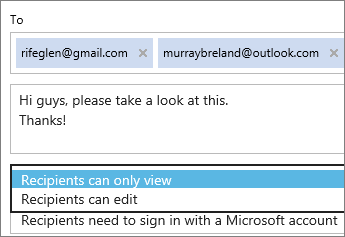 Note: If you want to restrict who can see the document, click Recipients don’t need a Microsoft account, and then switch to Recipients need to sign in with a Microsoft account. After you go to Share > Get a link, click Edit and switch to View only before you click Create link. Note: If you want to open up view-only access to your document so that people can find it when they search the web, click Public instead of View only.